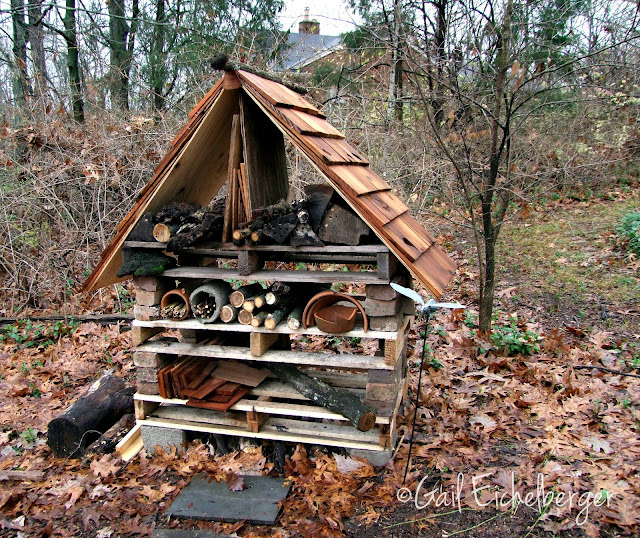 From the first time I saw a pollinator hotel/insect condo I began planning to build one for my garden. Although, I can't be sure which pollinators will move in, my inner budding entomologist will have a lot of fun observing and documenting what moves in and which accommodations they prefer. I am thrilled that you're here to see how it was constructed and I hope you build one for your garden, community center or school. 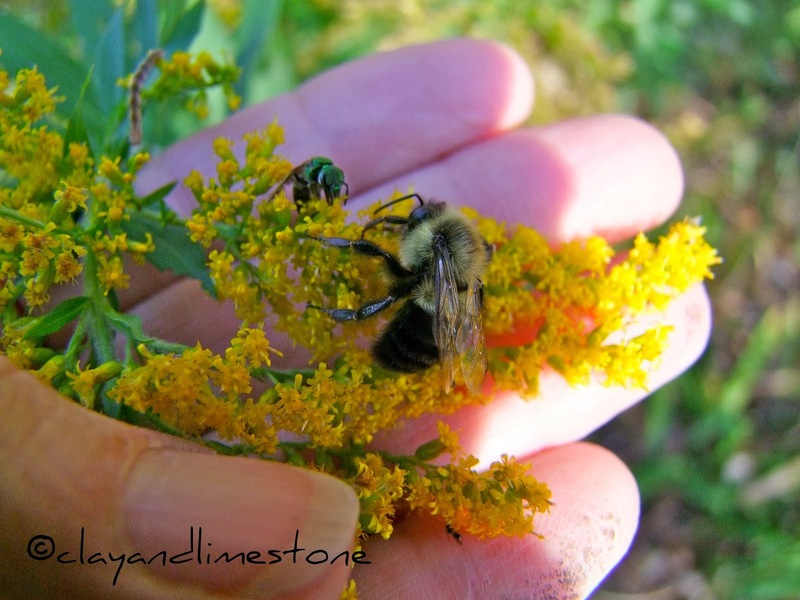 Please share your designs and what you've observed with all of us in the gardening community, so that we can continue to understand and help our native bees and other pollinators. 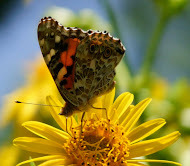 It really is always the right time to think about pollinators! Disclaimer: I am not a carpenter. No way, no how, so any of you with real skills can laugh your head off at my right brain construction techniques. What I figured out from doing this was that I really would love a workshop were tools are at the ready, plugs were nearby and I didn't have to spend a lot of time setting up and putting stuff away in a shed in the wayback of my garden. 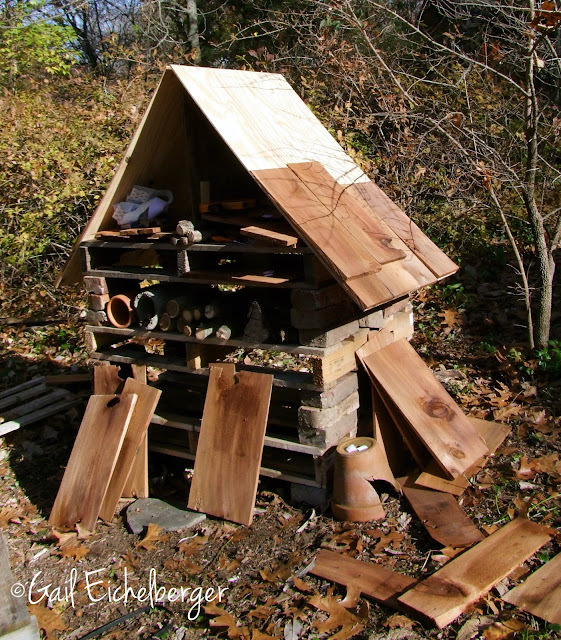 Having said that, let me tell you, that building my pollinator habitat was the most fun I've had in a long time. I hope the instructions and photos are clear and that you will soon be creating your own habitat. After looking at dozens of marvelous and creative pollinator habitat designs I decided the simplest design was one that used stacked pallets. They were easy to come by and required absolutely no skills except stacking them so they would not topple over in the wind or snow. I got mine free from a local garden center. But don't take just any, make sure you find ones stamped HT, that means they were heat treated not shot full of preservatives that could poison pollinators or you! I wanted this project to be simple to make, easy to reproduce and with easily located materials,. All the materials used were purchased at a home center or recycled from found materials. I placed the first pallet section on concrete blocks that were securely set in the ground. Then, I used three bricks on each corner to hold the next pallet making sure they were steady and secure and continued this process until it looked tall enough...I only needed three. I liked it, but it lacked a certain pizazz. Even when I began filing the spaces with pollinator habitat materials it still looked dull. It really needed a roof! I hinged the roof pieces together with small door hinges and held it upright on the tower with a 20"x 24" center board of 1/2" exterior plywood. The center board is braced between two pieces of oak and then shimmed. 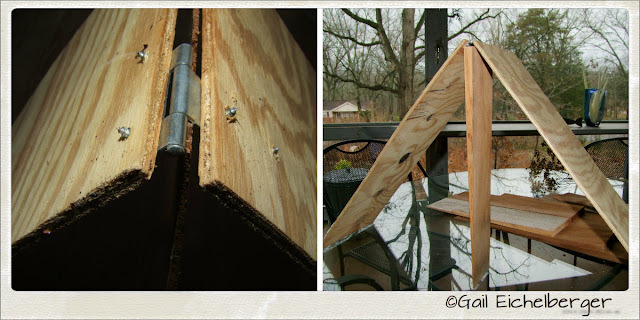 The center board, hinges, shims and oak braces are from old projects. Now, here comes the fun part~hanging the shingles! Shingling is not difficult when you're standing on the ground and don't care if it's not perfect. Just do an internet search and get the basics from one of the excellent videos that's available. I especially liked this one from Fine Gardening. I glued the shingles to the roof and held them in place with staples while they dried. Here's what I learned from the shingling project! Shingling is a bottom up project! The fat edge of the shingles are the bottoms! When laying the shingles make sure the seams don't line up, this protects the roof from leaking. I tried many combinations of shingles to avoid having to cut them to size. Construction adhesive is marvelous and easier to use than trying to nail into an attached sandwich board roof! A few staples will hold the shingles in place so the glue can dry. You will need to make a ridge cap to cover the gap between the two sides of the roof. 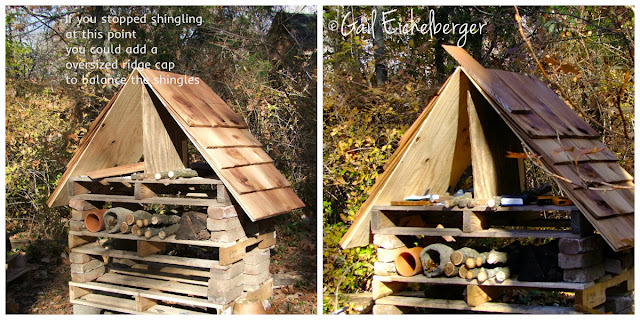 You can make a fancy over sized ridge cap that does double duty as a ridge cap and the last course of shingles. 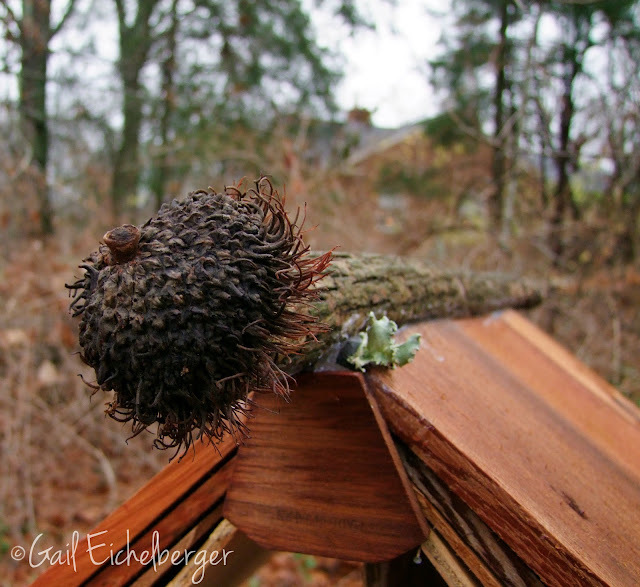 Use a small straight tree limb to make a ridge cap. It looks especially festive with a Bur Oak acorn cup to cap it off. All that's left to do is finish filling the habitat with pollinator friendly materials. 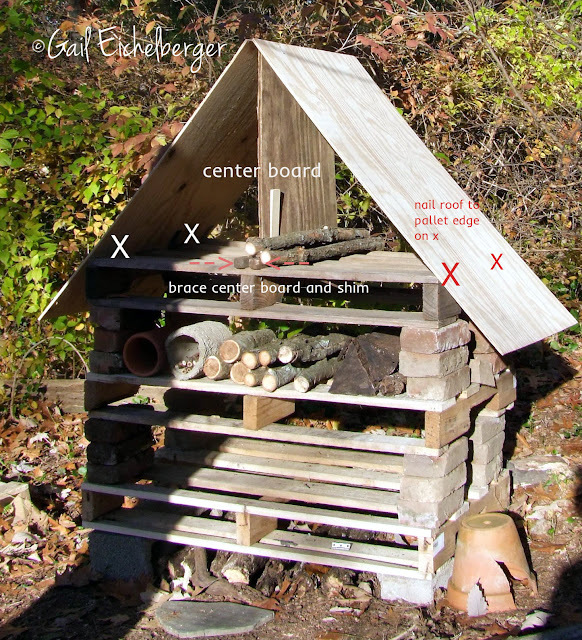 Now go forth and have fun building your own Pollinator Condo! PS It bears repeating, if you want pollinators in your garden, you must never, ever, ever, ever use pesticides and think about adding a bee block or condo! 2-2"x2" boards 24" long to brace the center board. Looks awesome Gail! 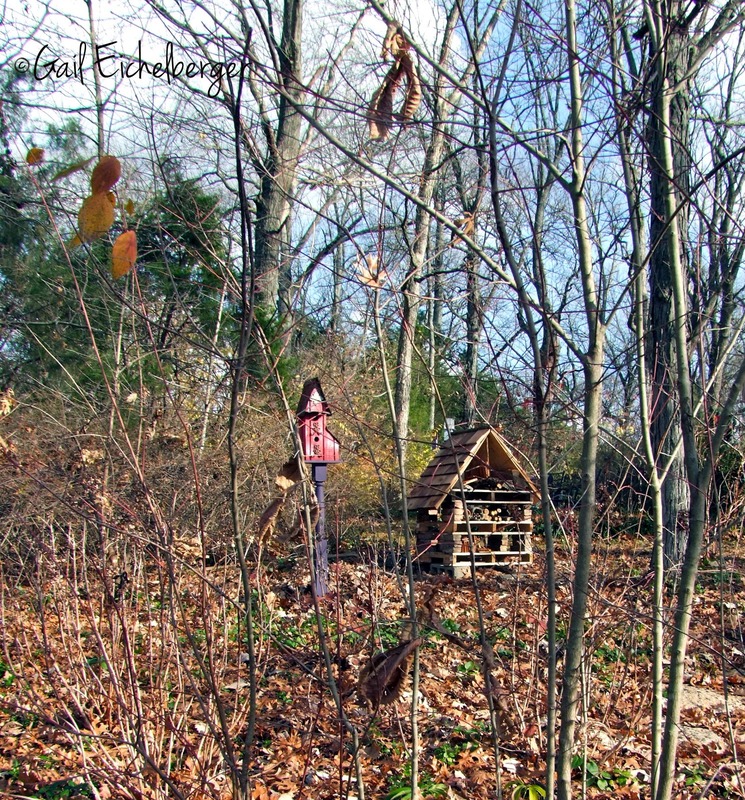 I am sure the pollinators will be happy to call it home. I am looking forward to hearing about how long it takes for them to move in and if the various pollinators are friendly sharing the same quarters. That is so cute, Gail, well done! These well written instructions show that this project is doable for most anyone. I am now planning a habitat for the Fairegarden thanks to your inspiration! What a fun project. I love the ridge cap. You must have some huge burr oak acorns. So, now you just sit back and wait. I think one of those time lapse cameras may be in order for you for Christmas. Great job and attractive as well. it is absolutely lovely. what a fun project indeed. i will look forward to seeing who checks in at the condo. happy insecting! The pollinators will be lining up for an apartment. Thanks for the how-to. I'm glad you shared this, Gail. I have been admiring your progress on the condo for a while. I would love to build one here. Thanks for sharing your process! Just lovely. Gail, you just mentioned to me on facebook that this would be a great project for a school. I wanted to post that idea here, too, so it could live online longer than it might on a fb feed. GREAT idea. Several grades could be involved: the older ones with the more heavy/complicated elements of construction, the younger ones with the gathering and arranging of the condo units. 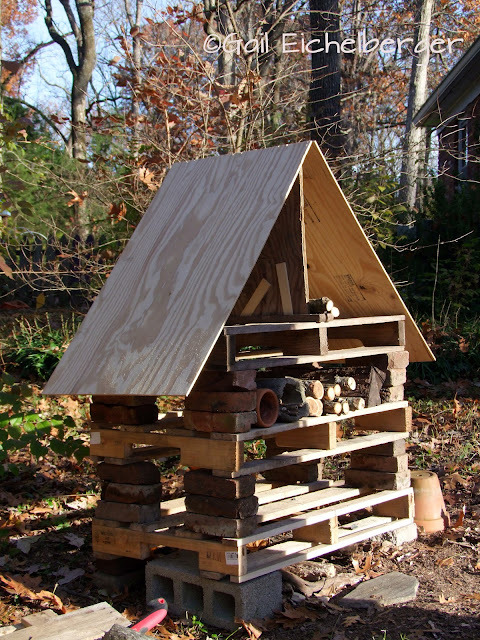 I've seen wee condos online, for sale, but your DIY is perfect for a school.... Thanks so much for the idea, the plans and the other idea! I'm impressed by your building skills and I'm sure your tenants will be very happy in their accommodations! I am inspired. I really want to do this. Very creative use of materials to keep the costs down...I love your design. I bet you can't wait until the new tenants move in, that will be a exciting day for you. Wow Gail this is quite a home. I have a little on that I need to place in the perfect spot, but yours is amazing. Can't wait to see who moves in. Thanks for the how to, I had no idea it was this large when I first saw the photo. Looks quite simple for such great benefits. Wow, that is a nice edition to your garden. Maybe I'll make this a spring project? Very interesting idea and a great tutorial. It will be fun seeing what moves in. Thank for taking the time to post this. Gail, thanks for the wonderful idea and the detailed instructions and material list. That's so cool Gail! Looking forward to seeing who makes this house a home! I am very impressed. Think you will have a lot of little friends in their new digs. You are a carpenter! 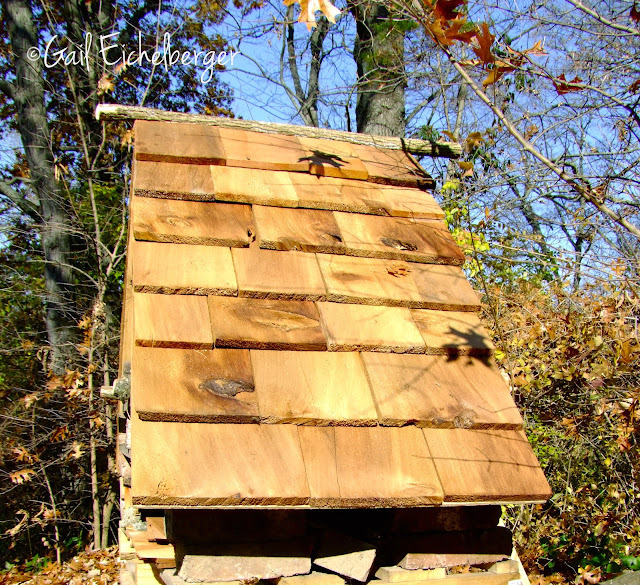 Great home for your pollinators. Thanks for sharing your creation and instructions, Gail. I never considered doing this, but now I just might do it. Great idea! shrub is beautiful with bright white flowers in spring and summer. Also add exquisite orange and red colors. During the spring bloom beautiful white flowers on it. Viburnum prunifolia brings beautiful features of your home or garden, because it can only add to the appeal, but may also add beautiful leaves in the fall, as well as add value to your home. Black Haw has many clusters of white flowers and is also used for many medicinal uses, such as stomach pains and burns. It has been said that many people use this bark to make a tea that can be used for premenstrual pain, bleeding and other medical problems. Gail, your condo is so impressive; I know the pollinators are going to be lining up for first dibs on the best apartments. I'm curious to see who picks the penthouse:) I must admit I've never seen one of these habitats before, but what a great idea! I know we must have a few of these materials already on hand here, and I've got just the place for one. Thanks for sharing the instructions! 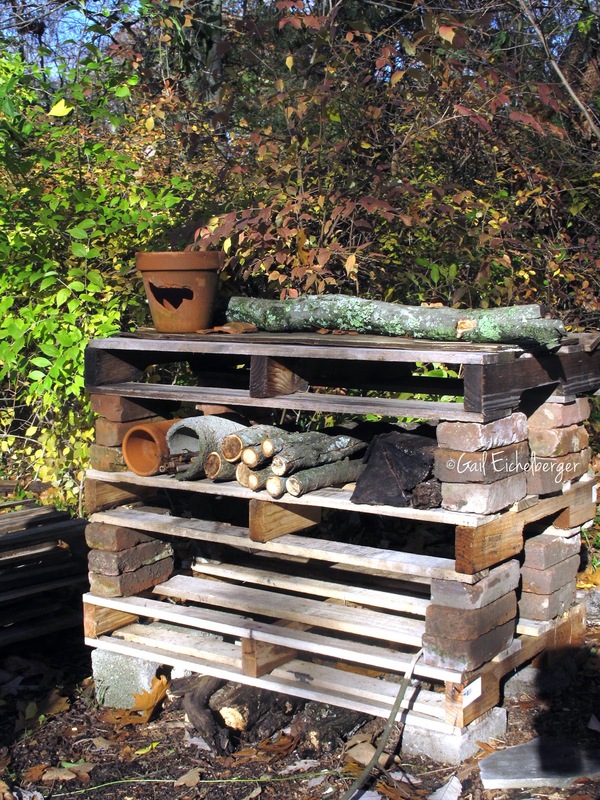 What a creative use of old palettes! Very nicely done! I love this, Gail! I hope you get some good occupants. I am going to send Larry a link to this post. I've seen the "store bought" version of these, but yours is WAY better! Soo cute!! I've seen those little mason bee houses before, but I love your big pollinator mansion! I might have to build one of those at some point!